Maybe autocorrect changed it to that when Steve Miller wasn't looking. I also hate to see Fair leave, but think Ansley is a very good hire. It was apparent that Pruitt did not trust Fair as he was essentially coaching the position himself. I said that one of Pruitts worst moves was not retaining Warren. He needed a mature, proven coach. Pruitt wasn’t happy with recruiting. I don't think he was either. Steve probably wrote that song on an iPad back in the 70s. It text corrected wrong for him. Mine were correct after all. Sounds legit. Looks like you asked a question. Not even a statement, much less a prediction. Why? Does Pruitt expect coaches to be good coaches & ace recruiters also? Are we going to have coaching turn over every off season, like Bama does? I called the Internet back in 1974. In this case, I think Pruitt didn’t see either quality. Bama is an extreme example...how about UGA? If assistants only leave for PROMOTIONS or EXTREME RAISES, you gotta like our chances for relative stability. Taking the weekend off and will figure things out on Monday. What is this garbage? Is this considered reporting? Please tell me this is old and they are known for shotty work. They dont even list all the coaching changes and it explains nothing. If these people are getting paid good money I am flabbergasted. I'm surprised that you're surprised. Most of the articles I read are just as useless. And it's especially true at this time of year. It's old, the date was the 7th. 9. No Spamming. Please don't post links to your site or your buddies site without prior approval of the board administration. Links to commercial news sites are always acceptable, but spamming links or plugs/references to personal sites, personal/individual UT fan blogs, other Tennessee message boards, personal twitter/facebook, etc. is typically not allowed. Otherwise, we end up with a board full of spammy links every time someone posts a new blog, tweet, or status update. 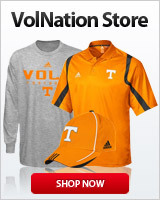 Coach, take two weekends off - you certainly have earned that from us, Vol Nation! Yeah, but keep your phone turned on!